Product categories of Steel Wire Armord (SWA) Cable, we are specialized manufacturers from China, Steel Wire Armord Cable, Swa Steel Wire Armored Cable suppliers/factory, wholesale high-quality products of Shallow Water Cable R & D and manufacturing, we have the perfect after-sales service and technical support. Look forward to your cooperation! 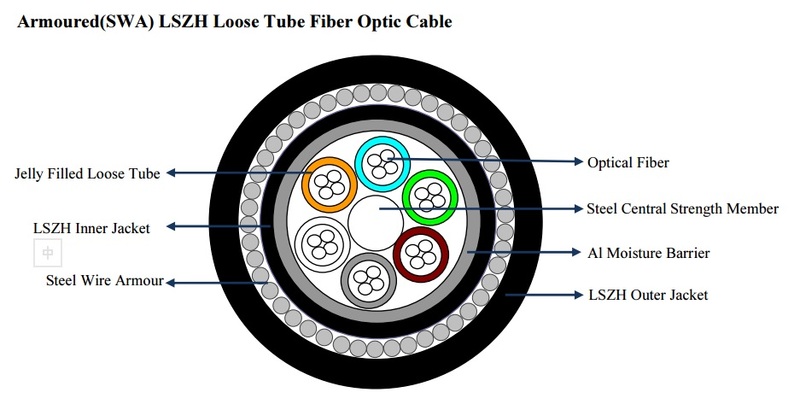 The steel wire armored cable is called SWA cable and Shallow water Fiber Optic Cable , used under water , they must have excellent tensile up to 10,000N and crush performance guarantee to operate well under water ,so SWA cable designed with 12-24 pcs of 1.0/1.2mm Steel wire arround the fiber core . We provide the SWA cable to many customers who used for oil&gas field ,vessel ,ports and so on . Most of SWA cable need LSZH outjacket for good fire resistant performance according IEC 60332-1, 60332-3C .